North Coast brewing makes a handful of delicious beers, and then a bunch of other beers that hardly seem worth the time. 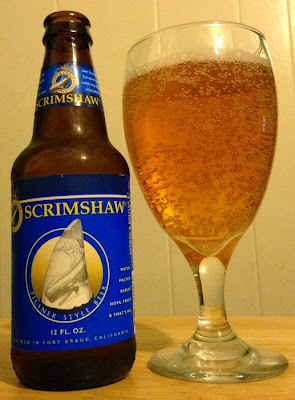 Scrimshaw Pilsner says on the label that it's brewed with water, barley, yeast, hops, and that's all. It pours a light, sparking yellow. The brief head is gone in an instant. There is no aroma at all. Pure water is as aromatic as this beer. The flavor still manages to taste like a pilsner. I’m not the world’s biggest pilsner fan, so that might not be a compliment. There is a little malt, on the flavor, some fruity yeast, and then mild hops. Goes down clean. This isn't a bad beer, it just isn't much beer at all. Scrimshaw leaves no impression.